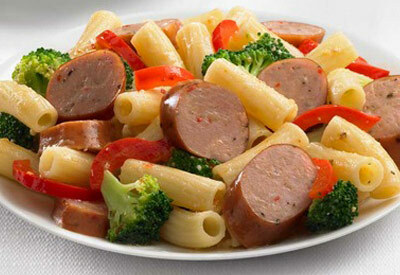 Dinner is on the table in 30 minutes with this rigatoni, sausage and veggie dish sprinkled with grated cheese! Cook rigatoni according to package directions in a large saucepan; add broccoli during the last 3 minutes of cooking time. In a large skillet, combine sausage, red bell pepper and Italian dressing; cook over medium heat until heated through. Drain pasta and broccoli; transfer to a large bowl. Add sausage mixture; toss to combine.